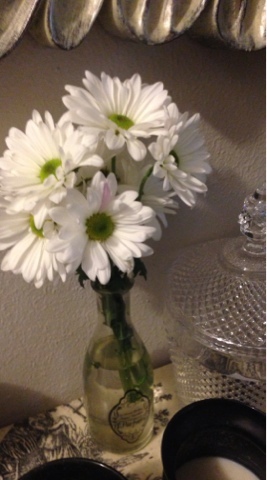 I love fresh flowers! When I was young, I thought girls only got flowers from boys! One day, I just decided that I am not going to wait to receive flowers! I am going to buy my own! It was very liberating for some reason! Back in the late 90's, I started buying gladiolas for my breakfast room table. They were so tall and dramatic. Now, I just buy these sweet simple flowers. I got these at Whole Foods. I usually just pick up whatever catches my eye, is seasonal, and fits my budget at the time. Sometimes just some simple white roses or hydrangeas. I picked these as they remind me of the last days of summer! I just place them in little nooks around the house! They make me smile ! 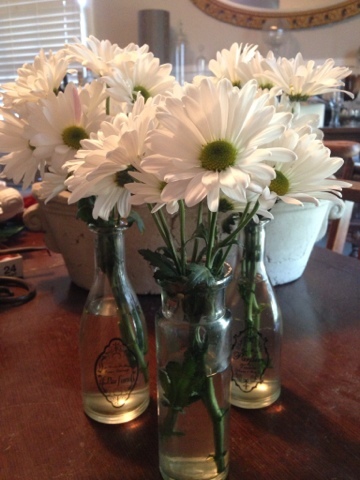 Do you have fresh flowers in your home?